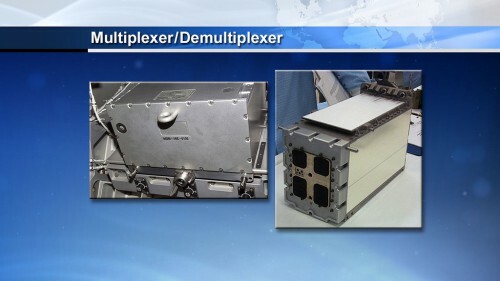 Expedition 39 spacewalkers Rick Mastracchio and Steve Swanson will venture outside the International Space Station (ISS) early Wednesday, 23 April, to remove and replace a failed backup Multiplexer-Demultiplexer (MDM) on the Mobile Base System (MBS). Designated “U.S. 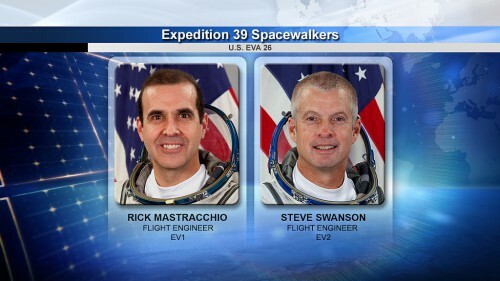 EVA-26″, the excursion is expected to get underway at about 9:20 a.m. EDT and should run for approximately 2.5 hours. It will be Mastracchio’s ninth career EVA and Swanson’s fifth and has been described as one of the simplest and least complex of the “Big 12″ spacewalks for which crews train to perform in order to hedge against the loss of critical ISS components. Assuming it takes place as planned, EVA-26 will also establish Mastracchio as the world’s fifth most experienced spacewalker. 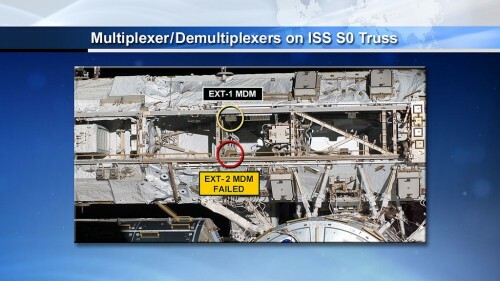 Tomorrow’s EVA came about following the failure on 11 April of the EXT-2 MDM box, which provides backup capability to its prime sibling on the space station’s S-0 truss. According to Flight Director Brian Smith, who will oversee EVA-26 and who has led the “Team Four” efforts at the Johnson Space Center (JSC) in Houston, Texas, to respond to this critical event and re-establish the ISS in “a good risk posture”, efforts were made to power-up EXT-2 for a routine health check, but proved unsuccessful. Mr. Smith explained in a recent NASA press briefing that of the 46 computers on the U.S. Orbital Segment (USOS), 24 are external, making the timely replacement of the EXT-2 box highly urgent. The difficulty was that if EXT-2′s primary sibling also failed, it would cause the loss of Solar Alpha Rotary Joint (SARJ) controllability, the loss of commanding capability for the thermal control loops and also threatened to impair NASA’s ability to power-up redundant equipment. 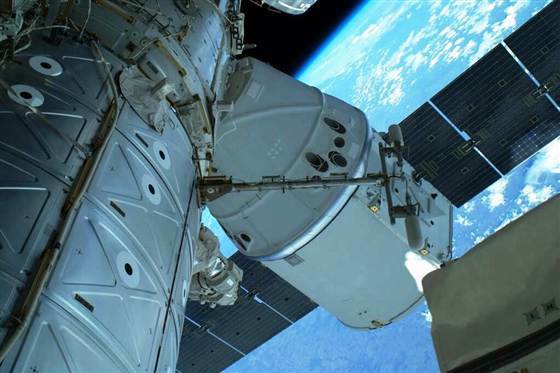 In the case of visiting vehicles, including SpaceX’s Dragon, such critical failures would have a direct impact upon the ability of these craft to dock or berth with the ISS. According to Mr. Smith, the team experienced problems powering-up the EXT-2 MDM and was forced to declare it as having failed. The box has been aboard the S-0 truss since it was launched and installed aboard the ISS by the crew of shuttle mission STS-110, back in April 2002. It was responsible for routing commands to various systems on the station’s inboard truss, including the cooling system, radiators and the MBS itself. Late on 12 April, NASA managers decided to press ahead with forward planning for EVA-26 and it was hoped to execute the contingency spacewalk as early as the 22nd, just before the planned undocking of Russia’s Progress M-21M cargo craft on the 23rd for two days of Kurs-NA (“Course”) navigation system tests. As circumstances transpired, EVA-26 was moved until 23 April and it will occur shortly after the Progress M-21M undocking. This is the third contingency EVA to be performed by U.S. astronauts since the much-publicized EVA-23 in July 2013, during which water intruded into Italian astronaut Luca Parmitano’s helmet. In the following weeks and months, investigators dug in to uncover the root cause of this life-threatening incident. NASA’s Mishap Investigation Board (MIB) reported its findings in February 2014, although several “open” issues still remain to be closed on the engineering fault tree, ahead of the expected resumption of “planned” U.S. EVAs with a pair of spacewalks involving NASA astronauts Steve Swanson and Reid Wiseman and Germany’s Alexander Gerst in July. Until those issues are fully closed-out, ISS Program Manager Mike Suffredini was adamant that he does not want NASA astronauts performing any non-critical tasks until the problems with the Extravehicular Mobility Units (EMUs) are fully understood and the hazard work is completed. For that reason, in response to questions about why Mastracchio and Swanson will not be assigned any other “get-ahead” tasks, Mr. Suffredini asserted that they would only be outside for as long as it took to complete the MDM removal and replacement operation. That is expected to require about two hours and 30 minutes. Faced with other queries about the apparent frequency of contingencies aboard the space station—most recently EVAs-24 and 25 in December 2013 to remove and replace a failed pump module—Mr. Suffredini added that ISS Program planning anticipated about 6-8 EVAs per year at this stage to handle faults and equipment failures, but that the systems were actually proving considerably more reliable and robust than expected. Tomorrow’s EVA-26 will involve EMU suits No. 3011, which was used by Luca Parmitano on his dramatic spacewalk, and No. 3005. Both have been fitted with new fan pump separators and are considered the best prepared of the three suits currently aboard the station. After an early breakfast, Rick Mastracchio and Steve Swanson will enter the Quest airlock and jump onto a well-trodden path of 60 minutes of pre-breathing on masks, during which time the inner “equipment lock” will be depressed from its ambient 14.7 psi down to 10.2 psi. Assisted by Expedition 39 Commander Koichi Wakata, their next step will be to don and begin purging their EMUs, after which the Quest atmosphere will be repressurized to 14.7 psi. They will undertake a nominal pre-breathing protocol, lasting about 50 minutes, followed by a further 50 minutes of In-Suit Light Exercise (ISLE). This will require Mastracchio and Swanson to flex their knees for four minutes, rest for one minute, then repeat over and over, until the 50 minutes are over, and serves to remove nitrogen from their bloodstreams in a shorter time period. About an hour before the scheduled 9:20 a.m. EDT start time of EVA-26, the fully-suited pair and their equipment will be transferred into Quest’s outer “crew lock” and hatches will be confirmed to be closed and sealed. Depressurization will be briefly halted at 5 psi for leak checks, after which the process will resume until the crew lock reaches a condition of near-vacuum. A few minutes before the spacewalk is due to begin, the pressure will hit 0.5 psi and soon afterwards Mastracchio and Swanson will be given the go-ahead to open the outer, Earth-facing (or “nadir”) hatch. EVA-26 will officially commence when the astronauts transfer their space suits’ life-support utilities over to internal battery power. Mastracchio will be first out, followed by Swanson, and their first few minutes will be spent checking the integrity of each other’s suits and tethers. 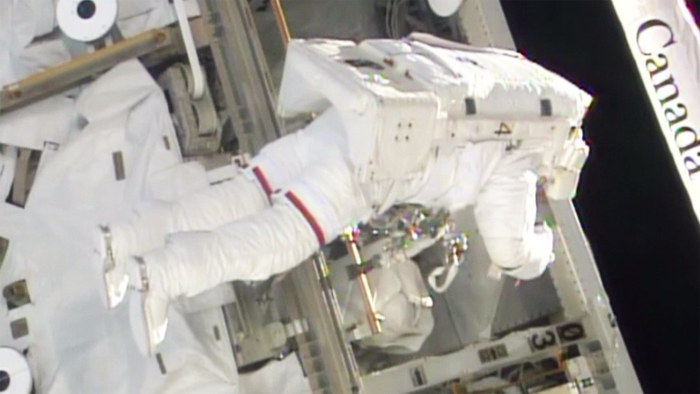 Mastracchio, with eight EVAs currently under his belt, is presently the world’s sixth most experienced spacewalker, with a cumulative total of 51 hours and 28 minutes. Less than 25 minutes into tomorrow’s EVA, he will surpass Russian cosmonaut Fyodor Yurchikhin to establish himself as the new No. 5 spacewalker in the world. 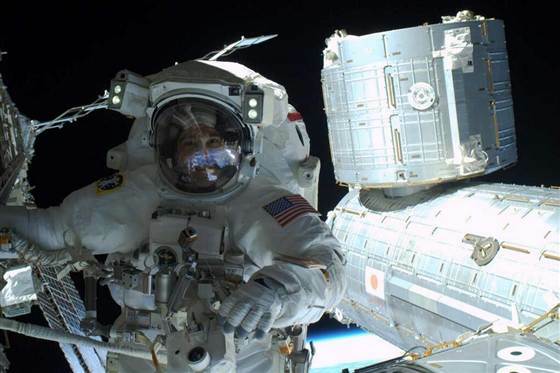 Swanson is also a seasoned EVA veteran, having supported four spacewalks on previous missions, and has spent 26 hours and 22 minutes working in a pressurized suit in the vacuum of space. According to Lead U.S. Spacewalk Officer Glenda Brown, EVA-26 will also be the 179th spacewalk dedicated to the assembly and maintenance of the ISS since December 1998. Carrying their tools and the 50-pound (22 kg) replacement MDM in an Orbital Replacement Unit (ORU) bag, Mastracchio and Swanson will depart Quest and translate, via the Crew and Equipment Translation Aid (CETA) Spur to the S-0 worksite. The Mobile Transporter, which normally occupies a position directly over the failed MDM, has been moved and upon reaching the worksite the astronauts will stow their ORU bags. Mastracchio will enter a “heads-down” orientation, directly ahead of the failed unit, to initially inspect it for physical damage and acquire photographs if orbital daylight permits. He will remove a scoop-like handling tool and drive three bolts on the front of the MDM, releasing the two outer tie-down bolts first, followed by the primary jacking bolt. This should enable him to essentially slide the failed unit directly out, where it will be temporarily stowed. Assisting Mastracchio by handing him tools, Swanson will stand by as an extra pair of hands, eyes and ears. The two men will inspect the cold plate and “blind” electrical and power connectors on the replacement MDM, after which Mastracchio will install the centre jacking bolt and the two tie-down bolts to secure it in place. The scoop handling tool will then be removed and stowed, after which the spacewalkers will gather up their tools, pack up their ORU bag with the failed MDM and return to Quest. 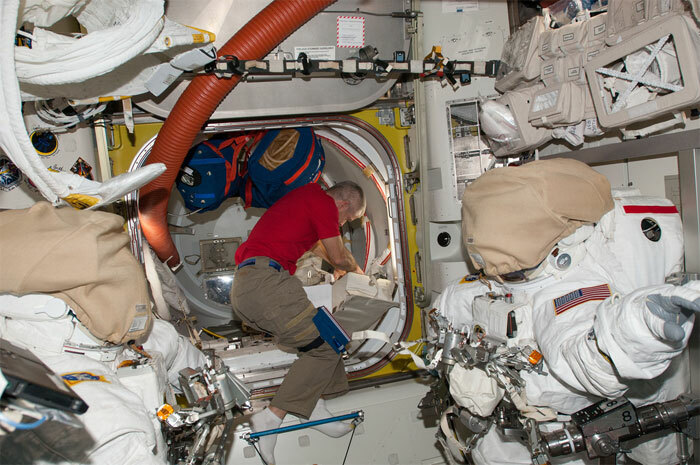 A high degree of confidence exists that EVA-26 will be completed smoothly and former ISS resident—and veteran spacewalker—Chris Cassidy spent time in the Neutral Buoyancy Laboratory (NBL) on Friday, 18 April, rehearsing the removal and replacement task. NASA Astronauts Steve Swanson and Rick Mastracchio have completed a short spacewalk to replace a failed Multiplexer/Demultiplexer (MDM) back up computer. They began the re-pressurization of the Quest airlock at 11:32 a.m. EDT signifying the excursion’s end time. The backup computer failed April 11 after a routine health check by the Mission Control team in Houston. While the primary computer continues operating flawlessly NASA managers ordered Wednesday’s spacewalk repair to ensure redundancy on critical systems. The computer outage did not pose a risk to the six crew members aboard the space station. 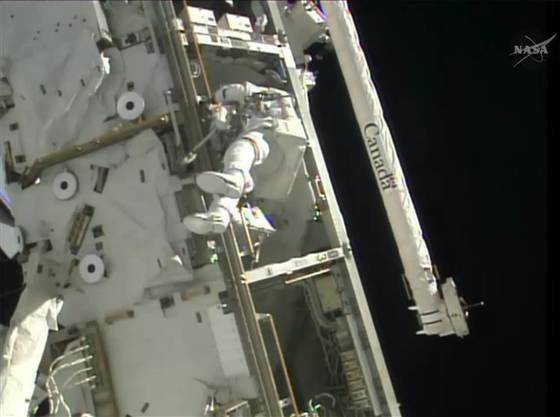 The duo worked on the S0 truss which is where the backup MDM is located. The truss is located above the Destiny laboratory module and forms the center of the station’s Integrated Truss Structure, or backbone. The MDM provides telemetry and commands to truss systems, solar alpha rotary joints and the Mobile Transporter rail car which rides along the truss structure. Swanson and Mastracchio installed a spare MDM that was housed inside the Destiny lab since April 2001 when it was delivered aboard space shuttle Endeavour. They removed the failed MDM from the S0 truss where it has been located since the truss was delivered with the MDM already inside in April 2002. The station houses 45 MDMs, 24 internally and 21 externally. Station and SpaceX managers decided the computer failure wouldn’t impact Sunday’s arrival of the Dragon commercial cargo craft on the SpaceX-3 mission. After an engineering review of the station’s systems it was determined the station had enough redundancy for SpaceX-3 to begin its mission when it launched Friday afternoon aboard a Falcon 9 rocket. A few hours earlier today an ISS Progress 53 resupply ship undocked from the Zvezda service module. It will back up about 311 miles from the space station so Russian mission controllers can test its upgraded Kurs automated rendezvous system. The Progress will redock again Friday at 8:15 a.m. to the Zvezda service module after the Kurs tests are complete. 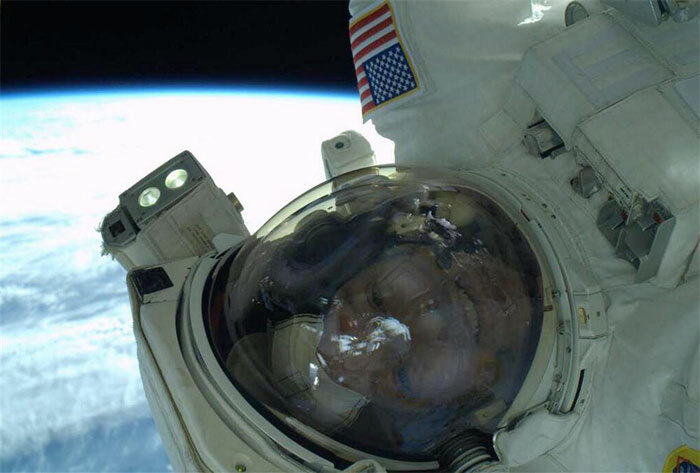 During Wednesday's fast-track spacewalk, NASA astronaut Rick Mastracchio complained that his arms were too short to take a selfie. But that didn't stop him from trying, or from sharing the results. "The spacesuit makes it very difficult to get a good selfie. I tried several today," Mastracchio tweeted hours after he and a crewmate, Steve Swanson, replaced a bad backup computer box on the International Space Station. Taking a space selfie was a toughie indeed, not only because Mastracchio was wearing a bulky spacesuit but also because he was in the space station's shadow, silhouetted against that bright blue planet in the background. But all things considered, Mastracchio's selfie is probably worth keeping in the photo album, along with his other shots. NASA astronaut Steve Swanson faces the camera during Wednesday's spacewalk, with the International Space Station's Japanese Kibo laboratory in the background. NASA astronaut Rick Mastracchio captured this picture of the SpaceX Dragon cargo ship docked to the space station's Harmony module during Wednesday's spacewalk. An astronaut performs a repair job on the International Space Station during Wednesday's spacewalk.